Uncertain U.S. policy comes at a bad time for Central Asia, especially in light of an attitude shift in Tashkent. The ornery position of the late President Islam Karimov has been replaced by the good neighborliness of Shavkat Mirziyoyev. Regional observers have adopted the euphemism “cautious optimism” to put reasonable constraints on their enthusiasm for Uzbekistan’s tonal shift. At a recent conference at George Washington University, hosted by the Central Asia Program, Nargis Kassenova, an associate professor at KIMEP University in Almaty, remarked that uncertainty with regard to U.S. regional policy comes at a bad time. “We see some gentle buds of regionalism,” Kassenova said. “And the U.S. can contribute to that.” Kassenova noted the potential value of the C5+1 format in encouraging regional cooperation. Ultimately though, if regionalism is to prevail in Central Asia, it will have to be driven by the region’s capitals themselves. Those gentle buds have been blooming most strongly — and most promisingly — between Uzbekistan and Kazakhstan. The positive vibes continued as Mirziyoyev made a surprising second visit to Kazakhstan in late April. 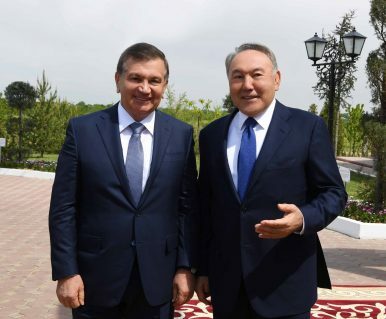 On April 29, Mirziyoyev met Nazarbayev in Saryagash, a town of less than 40,000 in southern Kazakhstan. Saryagash is less than an hour’s drive from Tashkent (and more than 23 hours driving from Astana). According to the Akorda Press service, Nazarbayev lauded the increase in business activity between the two states in the first quarter of 2017. “Trade turnover over the first three months of 2017 increased by 37 percent,” he said. The Uzbekistan-Kazakhstan relationship is perhaps the most important bilateral relationship within the region. No attempt at regionalism can succeed without the active participation of both states. While there are a plethora of groupings that include Central Asian states — the CSTO, SCO, EEU, for example — only the SCO includes both Kazakhstan and Uzbekistan and all three are dominated by the leadership of extraregional powers: namely Russia and China, in the case of the SCO. Has the time for real regionalism finally come? Perhaps. Strong political will — especially in Astana and Tashkent — is a necessary first step toward tackling the obstructions to regionalism, from simple bureaucratic capacity to engage in effective cross-border diplomacy, to trade regimes and thornier issues over water and the energy trade. Despite shared history, Central Asia has long lacked regional cohesion. That could be changing.